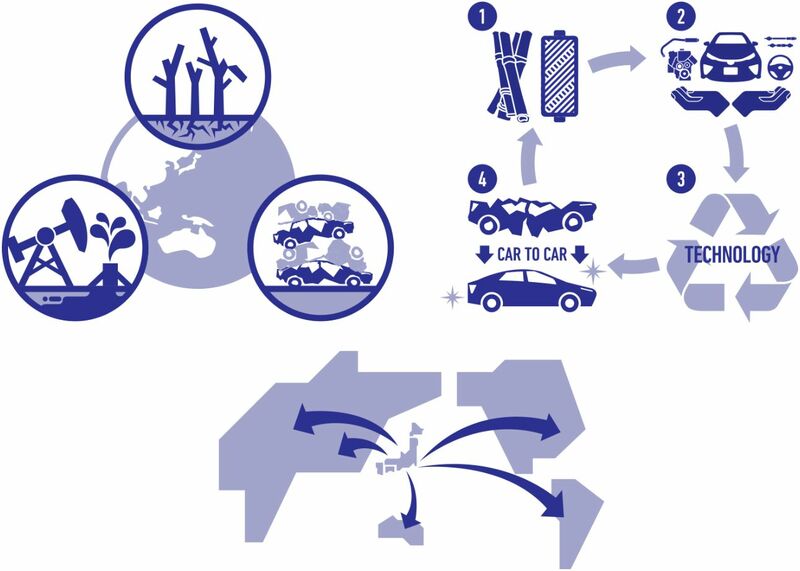 Toyota has set itself six environmental challenges that it plans to have in effect by 2050. As well as achieving zero environmental impact in all vehicle-related activities, Toyota wants these initiatives to have a positive and sustainable impact on society as a whole. The six environmental challenges are listed below, followed by a detailed description of how Toyota plans to implement the fifth challenge by 2050. Click on any of the further links to be taken to separate posts describing how each challenge will be implemented. Toyota has been working on the challenge of resource recycling for 40 years. But in going forward, technologies and systems that Toyota has pioneered in Japan will be rolled out across the world to establish a recycling-based society. The worldwide consumption of resources is accelerating with the increase in population, economic growth and the desire for convenient lifestyles. If present trends continue, large-scale exploitation of natural resources will result in their depletion, and appropriate disposal will be unable to keep pace with the increasing amount of waste generated by mass consumption. This, in turn, will result in environmental pollution. To improve resource efficiency and achieve a recycling-based society, initiatives are needed in four key areas: 1) use of eco-friendly materials; 2) improving part longevity; 3) development of recycling technology; and 4) making vehicles from the materials of end-of-life vehicles. What is Toyota already doing about this challenge? Toyota has already spent 40 years devising initiatives to reduce, reuse and recycle valuable resources. Among many advances is the widespread use of renewable and recycled materials, such as plant-derived plastics for vehicle parts and biosynthetic rubber for engine and drive system hoses. We are also incorporating industry-leading initiatives to improve the way vehicles are dismantled. This is evidenced in new structural designs that are designed to be easy to take apart and separate, to the installation of new electrical terminals so the vehicle’s wiring loom can be easily pulled out. From battery packs and bumpers to hydrogen tanks and tungsten tools, Toyota has a procedure to recover, reuse and recycle components in end-of-life vehicles. The sheer number and complexities of the systems already in place is staggering, so a special booklet has been prepared as a PDF download to help explain the lengths Toyota is already going to in order to achieve this challenge.